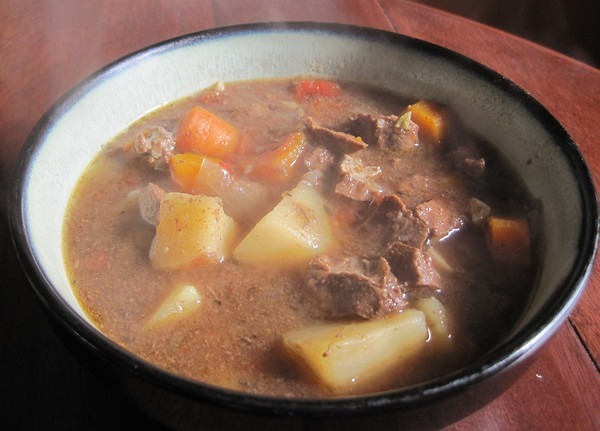 Two years ago I posted a recipe for Beef Heart Stew. Although it was better than my beef heart curry attempt, it was just “offal good“, not “awfully good“. So I revisited this recipe and came up with something far better. This time I added some potatoes and red wine. I also removed the Thai peppers, added cumin and extended the cooking time. Summary: A rich stew made from beef heart using a slow cooker. Cut up the onion and caramelize in pan with your favorite fat. I used tallow. Add to slow cooker. Cut up carrots and potatoes and put into slow cooker. Dice garlic and add to slow cooker. Cut up beef heart and add to slow cooker. Details here. Top off with beef stock and red wine. Cook on low for 8 hours. I like to cook the first hour on high. Because of the 8 hour cooking time, start this one early. I no longer believe 5 hours is enough time. Next Primal Certification? Are You Kidding? Thanks for the recipe inspiration. I think that beef hearts are a super-tasty introduction to organ meats for people who don’t necessarily like the characteristic taste of liver.